The first site specific project was implemented in 2009 and included relocating of a farm road out of the floodplain, restoring and revegetating the floodplain, and installing six large wood structures along the banks of Gales Creek. The project restored approximately 600 linear feet of floodplain with approximately 4 acres of riparian restoration. Two additional projects are in the design phase. 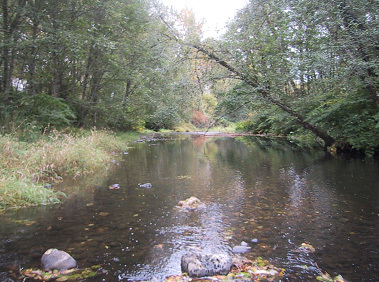 One project involves reactivation of approximately 800 feet of an historic side channel to improve summer rearing habitat for steelhead and coho salmon and implementation of a bioengineering approach to protect a highly eroding bank. The other project, which is the feasibility phase, includes enhancement of approximately two miles of channel and floodplain habitat via a levee setback. The levee would be set back approximately 100 feet on both sides of Gales Creek to improve channel and floodplain interactions and restore riparian habitat.